In 1848, as revolution swept through Europe, a group of young Englishmen formed a secret, artistic society. They called themselves the Pre-Raphaelite Brotherhood. This name clearly expressed their admiration for the early Italian artists before Raphael, whose influence and style had, in their opinion, corrupted the teaching of art. As young rebels are wont to do, they detested the establishment in the form of the Royal Academy of Art and called Sir Joshua Reynolds, its founder, "Sir Sloshua." They believed in painting from nature. If you want to paint a sheep on a meadow, drag said sheep to said meadow; if you want to paint a drowning girl, put (living) girl into bathtub and watch how her hair floats about in and on the water--in the latter case you might want to remember once in a while to replace the candles that are supposed to heat the bathtub. Otherwise your model might catch pneumonia... And they infused their works with symbolism--a moth is not just a moth, you know. In an attempt to imitate the early Italian masters, they used thin glazes of pigment over a wet, white ground, a technique which lends the colours in their paintings a startling brilliance. Their paintings are also startling in their scope: most of them are huge--indeed, some of them are so huge that they cover whole walls. 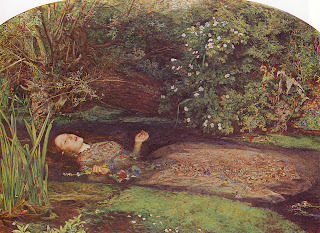 The influence of the Pre-Raphaelites on 19th-century art was enormous. 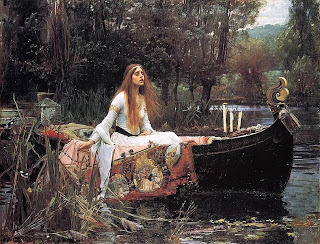 As a movement, however, the Pre-Raphaelite Brotherhood was very short-lived. 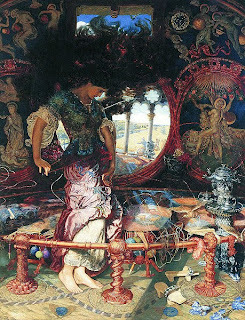 It was founded by Dante Gabriel Rossetti, William Holman Hunt and John Everett Millais in winter 1848, and the first pictures with the mysterious initials PRB--well, you have to have some cool secret code name when you create a secret society!--were exhibited a year later. Only a few years later, in 1853 Millais joined the detested Academy, which Rossetti regarded as the end of the brotherhood. Nevertheless, their influence lasted well into the early 20th century. While their first paintings received nice reviews, once the secret of the PRB had leaked out, the critics quickly changed their tune, as the founding of a secret society by some young upstarts was regarded as an affront to the establishment. Consequently, the paintings our hopeful young artists exhibited in 1850 were ripped apart in the reviews. 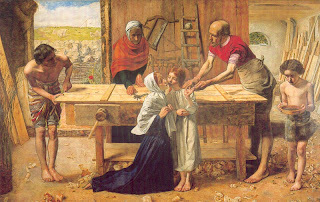 One painting which was particularly condemned was Millais's Christ in the House of His Parents. Dickens for example called the figure of young Jesus "a hideous, wry-necked, blubbering, red-headed boy, in a bed gown." Lizzie Siddal was also the model and muse of another painter, Dante Gabriel Rossetti. They married in 1860, yet there was no happily-ever-after for them. By that time Lizzie was probably already addicted to laudanum, and she died from an overdose in 1862. 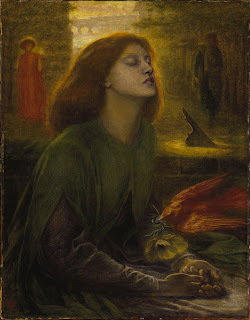 Rossetti channelled the grief for his wife into one of his most famous paintings, Beata Beatrix, which shows the female subject hovering between life and death, with a bird as the messenger of death dropping a poppy into her hands--a clear reference to the manner of Lizzie's death.